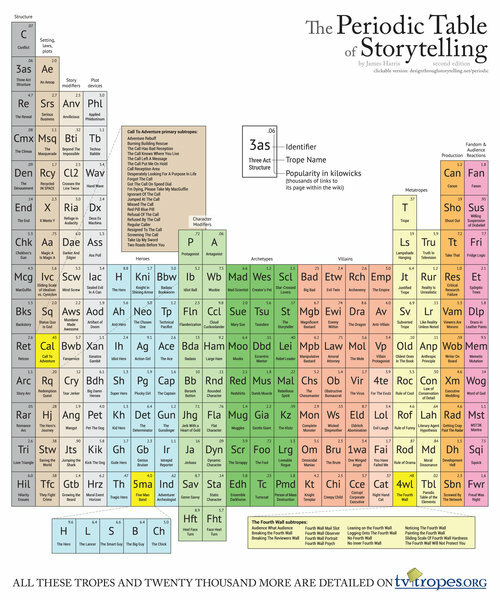 The Periodic Table of Storytelling, created by designer James R. Harris, is a version of the classic periodic table of elements using storytelling tropes from TV Tropes instead of actual elements. For example, Bdh stands for Big Damn Heroes, and Etw is for Evil Twin. The online version features clickable elements with story molecules, but the table is also available for purchase on deviantART. According to Harris, a portion of the profits go to help fund TV Tropes servers.